School's out for summer, but recess is IN at the St. Cloud Public Library. On Wednesday, June 15, the Mississippi Room will be turned into a playground for teens. You want four square? We got it. You want to hula hoop? We got it. You want to Chinese Jump Rope? Yep, we got it. Rain or shine, recess is fine! 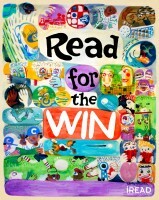 Come play from 1 to 3 p.m. And don't forget: while you're here, sign up for the Summer Reading Program! with locations in Albany, Annandale, Becker, Belgrade, Big Lake, Buffalo, Clearwater, Cokato, Cold Spring, Delano, Eagle Bend, Elk River, Foley, Grey Eagle, Howard Lake, Kimball, Little Falls, Long Prairie, Melrose, Monticello, Paynesville, Pierz, Richmond, Rockford, Royalton, St. Cloud, St. Michael, Sauk Centre, Staples, Swanville, Upsala and Waite Park.